Eye injuries are best assessed by veterinary examination. Prompt treatment is essential for the best outcome. Injuries can range from mild irritation to traumatic eye rupture. Even basic injuries of the eye can become quite severe if left untreated or treated incorrectly. The severity of a traumatic rupture of the eye constitutes an ocular emergency. A complete rupture means that the cornea or the sclera are no longer intact and the aqueous of the anterior chamber, the iris, and the lens are exposed. 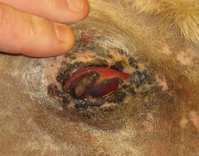 Horses that rupture an eye will be quite painful, they will have copious ocular discharge, and usually the eyelids will be partially closed. You may notice a dark protrusion on the cornea as seen in this photo. The protrusion is a prolapsed of the iris through the rupture hole. You may also see thick, clear liquid if aqueous is leaking from the rupture site. Many times the lens is also extruded. Horses usually rupture their eye by throwing their head into a solid object. They can also ram wire or other sharp objects through the globe. Rearing, falling or kicks can also cause rupture eyes. Rupture of the cornea usually results in such severe internal injury that it rarely results in a functional eye. There are however treatment options. An ophthalmologist can implant a silicone ball inside the globe after the eye has been eviscerated. The result is a blind eye that looks similar to the original eye. Depending on the size of the rupture, the cornea can be treated with a graph and extensive medical therapy. If the retina has not detached you may save some vision. However, the eye may shrink and the cornea may have extensive scarring. Because of the expense of medical treatment, the less than desirable outcome, and the long painful recovery time; many ruptured eyes are removed via enucleation surgery. 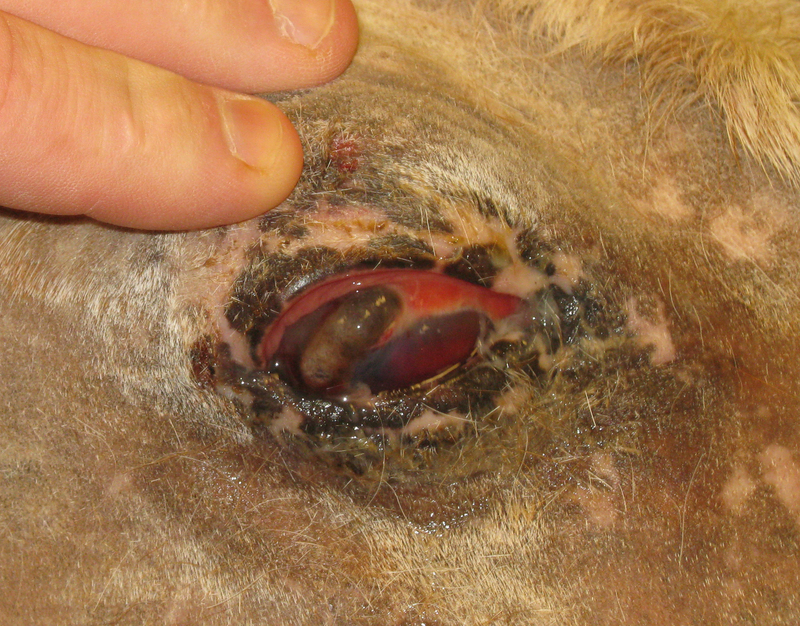 This photo is of a horse that was treated with enucleation surgery. During enucleation surgery the eyelids are incised just above the eyelashes and the entire eye ball is removed. The eyelids are then sutured shut. A horse that has had an eye removed initially looks like a horse with his eye shut but eventually the closed skin sinks into the eye socket so there is a depression. Horses that have had an eye removed usually do very well. There is very little pain after the surgery. Most horses adapt quickly to only having one eye. Many horses resume their athletic career.